New York Times, #1 Wall Street Journal, and USA Today bestselling author Catherine Bybee has written twenty-nine books that collectively have sold more than five million copies and been translated into more than eighteen languages. Raised in Washington State, Bybee moved to Southern California in the hope of becoming a movie star. After growing bored with waiting tables, she returned to school and became a registered nurse, spending most of her career in urban emergency rooms. She now writes full-time and has penned the Not Quite Series, the Weekday Brides Series, the Most Likely To Series, and the First Wives Series. For more information, visit www.catherinebybee.com. ‘Faking Forever’ is Shannon’s story in the First Wives series. This series follows main female characters that became close friends after their first marriages ended. While this is a lengthier book it is actually a fast read as it’s paced well which is unsurprising as the story line focuses on a jilted groom and a heroine who is looking for a one night stand to be a baby daddy. When Shannon plans to lengthen her working trip to include a hunt for a baby daddy, she had one rule in place.... their paths must never cross again and he must never be able to find her. In order to accomplish that goal, it would mean finding a man who would never want to find her. Victor is a busy man but the woman seated next to him is quick to point out how terribly rude he is as well as informing him what she would do if he were her boyfriend…and it’s not friendly. Surprises abound when this couple meet again and realise that he is the groom and she is his wedding photographer... When his bride to be takes off, Victor remembers her caustic words. The drama is relatively low angst despite the breakup of Victor’s wedding and some other outside forces that want to tear them apart. Their conflict is handled rather quickly and we are given a great epilogue that not only shows us this couple down the road but a bit of the other couples as well. Told in Dual POV, this is another winner as Catherine Bybee always is, her books catch the reader from beginning to end, they’re fun as well as romantic and a pleasure to read. 5.0 out of 5 starsExcellent finale to the First Wives series. Catherine Bybee has maintained her excellent standards of writing and creating plotlines to hold your attention in this fourth book in the First Wives series. Shannon (the quiet one) is the central character this time and her pathway to marital bliss is neither smooth nor straightforward, but it is ultimately rewarding. However following the route taken is an absorbing and heart warming experience for the reader. I LOVED THE WHOLE BOOK AND COULD NOT PUT IT DOWN. 4.0 out of 5 stars4.5 Stars, Catherine Bybee always amazes me with her stories! Shannon Wentworth wants a baby and feels time is running out. Mexico seems to be the perfect place to find a willing baby daddy, especially since no-one knows her and she won't run the risk of ever seeing the man she chooses again. However, when the bride of the wedding party whose photographs she'll be taking decides to flee before saying 'I Do', Shannon finds she could be in trouble with the groom since he believes she sabotaged his wedding. Will Shannon be able to convince Victor that he's lucky the wedding was called off or will they lose their shot at happy ever after because his ex-bride-to-be wants him back? Ms. Bybee always impresses me with her writing style, which encompasses enthralling dialogue that keeps me entertained from start to finish; hot and delicious heroes that know how to please the woman they want while battling tough obstacles to get the girl; and amazing friendships between strong women where their motto should be something similar to 'All for one and one for all', as they support each other through thick and thin. The way this story started had me immediately hooked, as the heroine has a plan and I loved how that plan goes totally awry and she finds herself falling for the groom whose wedding was called off. Then again, it felt like Victor dodged a bullet in having his wedding called off since his bride-to-be was an immature brat and Shannon is the perfect match for him. Moreover, the main characters are relatable, likeable and I loved their growing relationship because there's instant chemistry between them, but that doesn't mean either are going to give into it. Not when Victor is a workaholic and Shannon deserves a man that would put her first in his life instead of work. As for the dialogue, it was intense due to the main characters back stories and had me sympathizing with the heroine because her divorce hit her hard. Yet, in all honesty, she's better off without her ex-husband and is lucky to have such good friends in Lori, Avery and Trina. So, what more could she ask for, especially when she's looking to become a single mother? Furthermore, the heroine had me smiling constantly throughout this story with her sassiness and the way she speaks her mind, especially in the moment when she and Victor first meet and how Shannon tells the hero what women want from a relationship. Which made me think, 'Take that, Victor' and I liked how he began to realize how right Shannon is when it comes to his personal and professional lives. Certainly, being all work and no play makes Victor 'Mr. Monotonous' and having Shannon in his life definitely shakes things up. I also liked how resilient and courageous the heroine is because having a plan doesn't always work out and being spontaneous can sometimes be a good thing. And, in the heroine's case, meeting Victor is a very good thing. While the hero, his character progression is brilliant, as he goes from Mr. All-work-and-no-play to Mr. Play-and-less-work. Really, Shannon brings out the best in him and makes him realize that there's more to life than work. Furthermore, I enjoyed the tight knit relationship the hero has with his family. It's as close as the one Shannon has with her friends and I loved how the hero's brother teases him. Yet, what I liked most of all about the hero was his determination to win over Shannon because they're meant to be. Certainly, there are a few hiccups along the way, as trust is important to Shannon and without trust their relationship couldn't possibly survive. Yet, I'm glad that he never gave up, even when the going got so tough that the heroine might not forgive him. Overall, Ms. Bybee has delivered another spectacular and highly entertaining read in this fourth book of her First Wives series where the chemistry between Victor and Shannon was off-the-charts; the romance was sizzling and heated up the pages at the right moments; and the ending had me loving the hero's determination to show Shannon that she's the one for him and nothing will keep them apart. However, it was the epilogue that wrapped this story up perfectly, as the four women are so lucky to have each found their Mr. Right and be as happy as they are after everything they've been through individually and together as friends. 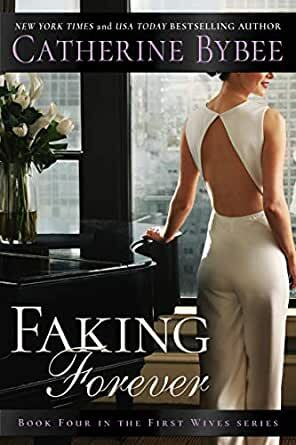 I would recommend Faking Forever by Catherine Bybee, if you enjoy the opposites attract trope, the enemy to lovers trope or books by authors Marina Adair, Jill Sanders, Jill Shalvis and Miranda Liasson. I have been waiting for Shannon's story since the series began, and Catherine Bybee did not disappoint. I went into this story pretty blind, other than it being Shannon's story, I didn't know a thing about it. I knew it would be wonderful being part of this series, and that was all I needed to know. We get insight into her past, delved into her mind for what she wanted for her future, and got to love her and the First Wives even more. My heart hurt for her as she tried to move on from her divorce and back into her true passions. The passion she found on the job though was not expected. I loved seeing her come out of her shell and into the forefront of the First Wives - she has always been a little in the background as the other ladies are such big personalities. Now she takes the lead, and what a story she gives us. I laughed, I cried, I truly enjoyed this story, and I can't wait for Sasha's story. 5.0 out of 5 starsStill the best! Thanks for another fab piece of writing. I love this author and am always excited when her newest novel comes out, and she does not disappoint. I fun read with great characters and friendships. I hope you enjoy it as much as I did!